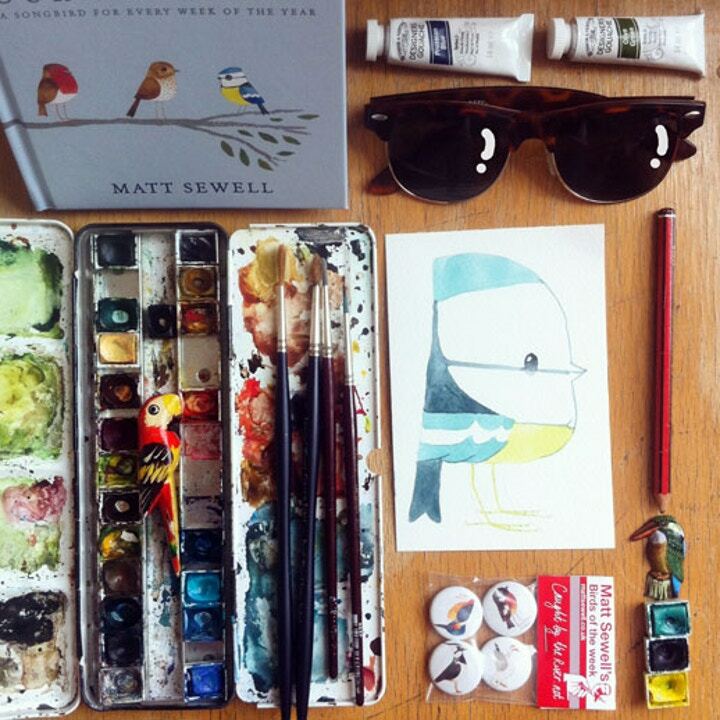 Introducing the man behind the charming characters in the book Our Garden Birds, Matt Sewell. Filled with admiration for his watercolour creations, Cass Art chats to Matt about his journey to watercolours and how it's possible for everyone. When was it that you first discovered your love for illustration? I’d gone through most of my education before I even really knew what illustration was. I’d got onto a daft course in Ipswich to study animation and a load of other things. It was an art degree for slackers who didn’t know what they wanted to do, so perfect really. After trying loads of things and getting stuck into animation I slowly realised that I was not that kind of calm, painstaking perfectionist that animators tended to be and that that slow, hair-pulling, stop motion technique had turned me into an alcoholic. So I started to look elsewhere and came across illustration that just sounded like you could do whatever you wanted. I had really enjoyed designing the characters when I was doing animation so I took that over into it. I also did loads of spray-painted painting, this was in '96 so I hadn’t learned how to paint at this point so the less said about this the better. A few years after leaving college I started getting editorial work for magazines, i couldn’t believe I was getting paid to create my own little worlds. I loved it from then. It has been an on and off affair though. Hating it so much at times that I’ve packed it in, but she tempts me back the harlett! You seem to specialise in birds, how did this come about? Do you sketch other subjects? Yeah I love to draw all kinds of animals, landscapes, letters. Pretty girls was a thing i was known for in the early 2000s but nature has always been there. Even when I was at the height of painting illegally in the streets it was still foxes, badgers and birds that I was putting up. Not very street I know. I grew up in the sticks so I’ve always had a keen understanding of wildlife and was a little bit obsessed over a couple of bird books I had getting people to test me on them and copying pictures from them. I’ve never been a twitcher but I’ve always known what was around me and just paid attention when ever I’ve been out and about whether in the countryside or in towns. Plenty of good birdspotting to be done in the city. My love of birds was rekindled during a sabbatical to Australia, my mate Tomo got me an Australian Bird Guide and I fell in love with it like I did the bird books I had when I was a kid. I saw so many amazing birds I realised that I was putting all the effort in the wrong places with my artwork and when I got back to the UK I would concentrate a small bit of my work on birds. Doing just that it has snowballed and birds seem to take up most of my time now which includes publishing three bird books, painting murals for the RSPB, wooden birds for the V&A and taking bird drawing classes at Glastonbury Festival 2013. What is your working process like? For example do you plan or is it entirely experimental? When painting birds I will study and sketch them first in my trusty Readers Digest Field Guide To British Birds or my Collins or a lot of the time on Google Image. I make sure I understand the shape and character and reduce it to its simplest markings. So even if it’s head and eyes are far too big and I’ve taken liberties with the colours, everything will be in it’s right place so people can’t complain too much. I love using watercolours as it's permanent and you have to make instant decisions. Those mistakes and experiments quickly turn into styles, purpose and confidence. So everything does start out as experimentation in the very beginning. Like everything in life I suppose. It dawned on me a little while ago if you want to make nice high quality looking artwork you gotta pay a little bit extra than just buying the cheap student grade stuff from The Works. So for my watercolours I use Winsor & Newton Artist’s half pans and i always use an Arches Watercolour paper block - it's lush. What's coming up in the future for Matt Sewell illustration? Will we be able to see your work exhibited? I have a new bird book out in June - Our Woodland Birds published by Ebury Press. Very much in keeping with Our Garden Birds and Our Songbirds but I couldn’t miss out on the opportunity of painting leaves and acorns so this new book features more than just the birds. I have a vinyl only compilation called A Crushing Glow coming out in April on Caroline True Records, which was an amazing project to work on. Not only did I get to select the music i got to do my own gatefold (lifetime ambition ticked) and produce a gorgeous couple of slices of wax. Its getting to that time of year when festivals are doing their thing so will be doing talks and drawing classes at Port Eliot and The Greenman so far. 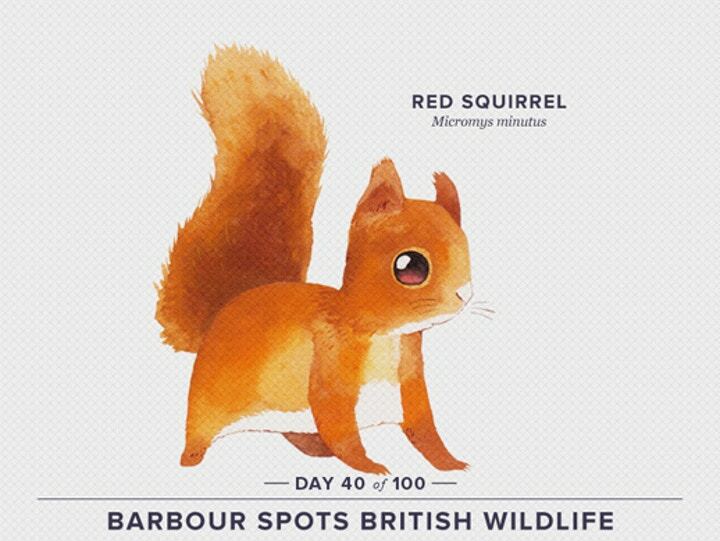 I have a range of t-shirts and more dropping this spring for Barbour womenswear, such a great job as I got to draw all my favourite British animals, I did loads can’t wait to see them. No exhibitions though but you never know. Cass Art stocks a variety of materials for you to get started at home. Pick up a beautiful book for endless inspiration and begin with a watercolour paper pad and set of portable set of watercolours for painting on the go. You could even try Cass Art's watercolour postcard pads to send your creations all over the globe. 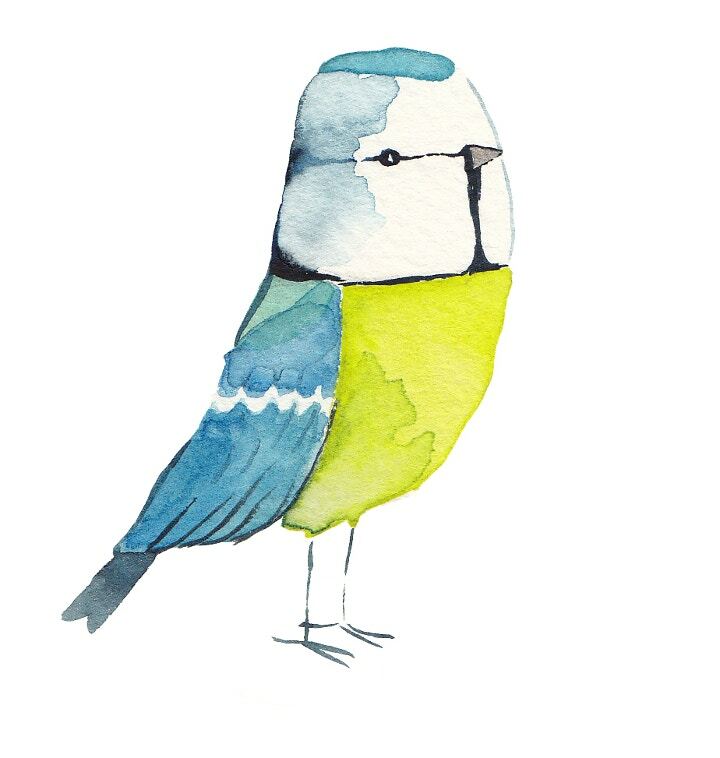 Shop online now to stock up on your art supplies and head in store to pick up Matt's book Our Garden Birds. Follow Cass Art on Facebook and Twitter for all the latest on emerging artists and materials. Check out more of Matt's work on his website and keep up to date with his current projects on Twitter.